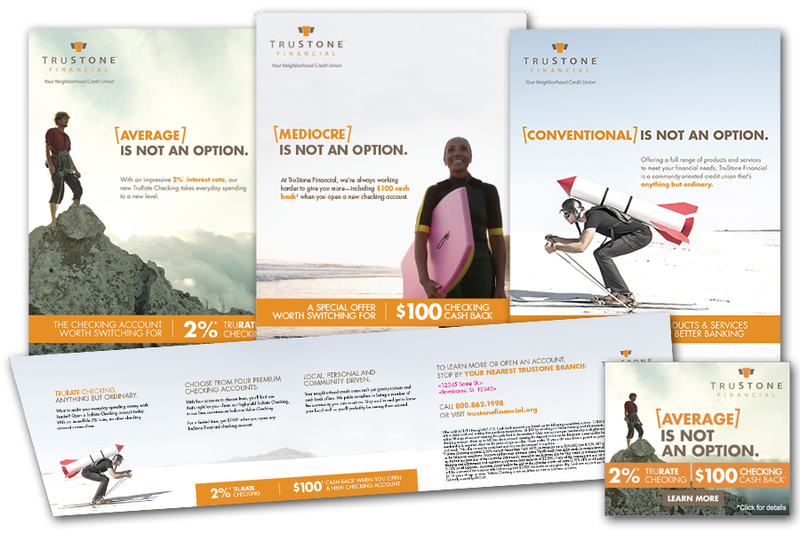 Our new client, TruStone Financial, asked us to help them promote their checking accounts—with an emphasis on the brand new TruRate Checking—through in-branch posters, digital ads and direct mail. In addition to the high-interest rate product, they were offering a cash bonus for opening any new checking account. With these great offers to talk about, and the fact that they like to have a little fun with their marketing, we were excited to jump into the creative process for this campaign. They ultimately settled on a concept which allowed us to take uninspired words and phrases like “average”, “conventional” and “mediocre” and follow them up with “not an option” to turn them into a positive. It was an unconventional way of telling their target audience that they didn’t see themselves as an ordinary financial institution—a message they are always trying to convey. The campaign allowed TruStone Financial to exceed their checking account goals for the two months that the campaign was in the market.